With its historic churches, mosques and temples, Jerusalem is a city accustomed to tension, capable of igniting a region that has known centuries of conflict. Sacred ground is sensitive ground, and Jerusalem is most sacred of all. Normally, the discord originates around the holy sites of the Old City, one densely packed square-kilometer surrounded by 700-year-old walls. This time it's an unassuming building, tucked into a hill about a mile south of the white limestone of the Old City, at the epicenter of an ongoing political and diplomatic earthquake. The building sits in an otherwise unremarkable neighborhood, surrounded by a small scraggly field, homes, and the Diplomat Hotel, long ago converted to an elderly care home for Russian immigrants. 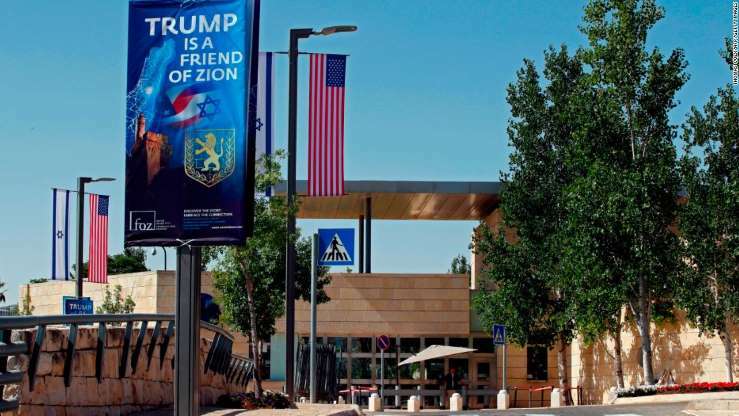 For eight years, the building in the neighborhood of Arnona has been the United States consulate in Jerusalem, where visitors would come to apply for visas and renew passports. On Monday, in a ceremony that will be surrounded with fanfare and celebrations, the building will officially become the US embassy in Israel in a move President Donald Trump promised during his campaign. Trump's decision to declare Jerusalem as the capital of Israel and relocate the embassy there from Tel Aviv overturned decades of US foreign policy. It prejudged arguably the most sensitive issue in the long-running Israeli-Palestinian conflict and set off protests across the Middle East, with many demonstrations targeting US embassies overseas. Shimon Aviv, a 45-year-old Israeli gardener who lives near the new embassy and was planting flowers outside in preparation for Monday, was gleeful. "The embassy relocation should have been a long time ago, but it's better late than never," he said. "I'm always happy to plant, especially when there's such a great reason. I hope many leaders will follow Trump's decision." So far, only Guatemala and Paraguay, two countries with large evangelical Christian populations, have announced they will move their embassies to Jerusalem. But Trump has not been swayed by the lack of international support for his move, and neither has Israel. "It is a great decision," opined Riki Turjeman, a 52-year-old Israeli woman who lives near the soon-to-be embassy. "I'm excited that finally Jerusalem is recognized as our capital. It is one of the greatest things that happened to our country." Undeterred by the prospect of added security, congestion, and perhaps even protests in the neighborhood, Turjeman said, "Good job President Trump!" The timing of the opening seems geared to please Israelis and anger Palestinians. One day before the opening of the embassy, Israel celebrates Jerusalem Day, marking what Israelis consider the reunification of the city. The day of the embassy opening is the 70th anniversary of the founding of the State of Israel (though not according to the Jewish calendar by which it is normally marked in Israel -- that was last month). On May 15 -- the day after the embassy opens -- Palestinians mark what they call the "Nakba" or Catastrophe, in memory of the more than 700,000 Palestinians who were either driven from, or fled, their homes during the Arab-Israeli war that accompanied the creation of the State of Israel in 1948. The day often brings widespread demonstrations and is considered a day of mourning. One day later is the first day of Ramadan, a holy month for Muslims that often sees a spike in tensions between Israelis and Palestinians. The city of Bethlehem is roughly five miles from the site of the new embassy, but it feels much farther away than that, sitting behind the concrete wall that separates Israel and the West Bank. Khader Yousef, who drives taxis and sells fruit in the city, said "no Palestinian should accept the fact of moving the embassy." "The US is saying that we have nothing more in Jerusalem. They are telling us that we have no hope in a Palestinian state with Jerusalem as the capital," the 53-year-old said. "Without a war there will never be peace, and what was taken with power can't be returned without power." Trump has promised to seal "the ultimate deal" to bring lasting peace between Israelis and Palestinians, but peace seems farther away than ever. Though Palestinian Authority President Mahmoud Abbas was hopeful after Trump's first visit to the region last May -- even saying "We rely on God, and then you" -- that optimism has given way to a very different reality. Following Trump's recognition of Jerusalem as the capital of Israel in December, the Palestinian Authority froze contact with the American administration. Those relations remain encased in permafrost, as Abbas has vowed to reject any proposal put forward by the Americans. The resentment is palpable amongst ordinary Palestinians. "If we don't accept the occupation, how will we accept moving the embassy?," asked Abu Mohammad al-Mashni rhetorically. "Trump gave an international legitimacy for Jews to occupy Jerusalem. He gave them the right to take Palestine," said al-Mashni, a 57-year-old spices and coffee seller who works near the Bethlehem checkpoint. "If the land is very dear to us, we can't not be angry." That anger was tempered with frustration for some, who see few options for political or diplomatic progress under Abbas. The aging President faces a widening rift with Gaza and waning interest in the Palestinian cause among regional Arab leaders. "Moving the embassy doesn't make a difference on the ground. It's already there," shrugged Yahia al Khatib, who coaches the Palestinian national basketball team. "It's a shame on the political level. Palestinian politicians and Arab leaders should start thinking a different way if they really care about the Palestinian state dream." The Trump administration has vowed to push forward with its Israeli-Palestinian peace plan, but the two sides could not be in more diametrically opposed positions, from the street to the government. Israelis are thrilled with Trump's apparently unwavering support for Israel; Palestinians are frustrated -- even furious -- with an American president who has so firmly taken one side. Given that reality, it is unclear why either would be compelled to say "Yes!" when Trump finally puts his long-awaited plan on the table.